Pope Francis has concluded his historic meeting with Patriach Kirill of Moscow and All Russia in Cuba this past week. Their Joint Declaration calls for Catholic and Russian Orthodox to stand together in support of persecuted Christians, and also to give a joint witness in favor of life and traditional marriage. The first two paragraphs contain the standard warnings against "proselytism." While the document limits "proselytism" to only those means of conversion which use "disloyal means" to convert people, we have seen how the word "proselytism" is infused with ambiguity in modern Vatican statements. While its usage always leaves room for people to claim it means only dishonest or immoral means to win converts - as in the above citation - we also know that for Pope Francis and many theologians "proselytism" is equated with conversion pure and simple, for example, an address of Francis in Argentine in 2013 where the pope condemned proselytism and said, "Do you need to convince the other to become Catholic? No, no, no! ", or when he said in Korea "with my identity and my empathy, my openness, I walk with the other. I don’t try to make him come over to me, I don’t proselytize" (source), where to "proselytize" is equated with getting the other to "come over"; i.e., convert. For more on the dishonest manner in which the word "proselytize" is used in contemporary documents, see the USC article "Proselytism and Conversion." The most interesting statement, however, is found in paragraph 25 where the pope and patriarch reject what is called "uniatism." What is uniatism, and why is it categorically rejected? Historically, uniatism was a means of reconciling churches of the Eastern Orthodox communion with Rome. This was done by usually establishing juridical and canonical norms particular to these communions that allowed them to retain some degree of cultural distinction in return for their recognition of the supremacy of the Roman Pontiff. This arrangement brought about ecclesial unity - hence their designation as "Uniate" churches. There are a total of 19 Uniate Churches with 253 bishops governing over 18 million worldwide. Some of these are very small, like the Albanian Byzantine Catholic Church (3,800 adherents) and the Greek Byzantine Catholic Church (2,400), while others are extremely large, like the Melkites and the Syro-Malankar rite, which each have near a million. The largest Uniate Church is the Ukrainian Greek Catholic Church, which has 44 bishops spread over 31 eparchies governing over 5 million Ukrainian Catholics. With 18 million adherents, the Uniate churches are by no means insignificant. It is wonderful that the new Joint Declaration concedes these 18 million Catholics "the right to exist." By the way, since uniatism is only a method for reconciling Orthodox to Rome (and not for converting Catholics to the Orthodox), this agreement to reject uniatism is very one-sided against the Catholic Church. The Russians give absolutely no ground; the Russian Orthodox have always hated the Uniate Churches and viewed them as traitors. Thus the Joint Declaration is essentially the Catholic Church adopting the Russian Orthodox perspective on the Uniate Churches. It is mind-boggling that uniatism is rejected as a model for reconciliation, since uniatism has historically been the single most successful method of reconciling the Orthodox. Why would the Church reject what has historically been the best tool in her chest for reconciling the orthodox? Because to do so implicitly means the uniate churches must break away from the Orthodox communion, and this is forbidden in the new world of ecumenism. This has been the Church's implicit position since the Ostpolitik of the Second Vatican Council, and was formalized in the Balamand Declaration of 1993. Please see our article on the Balamand Conference for the background of this declaration. 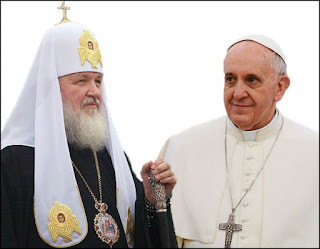 What this ultimately means is that, despite the show of unity between Francis and Kirill, this declaration brings us absolutely no closer to any sort of reunion between Rome and Moscow. Indeed, any such reunion is explicitly repudiated, as in paragraph 24 the Declaration bizarrely quotes Romans 15:20 out of context ("Thus I aspire to proclaim the gospel not where Christ has already been named, so that I do not build on another's foundation”) to make the point that Rome is not seeking converts from Moscow. It is astonishing that Francis' cites St. Paul in this manner; the other "foundations" St. Paul is speaking of are other Christian churches. Let us not forget that, from the Catholic perspective, the Russian Orthodox are schismatics. There is no precedent in Catholic ecclesiology for viewing schismatic churches as other "foundations" upon which we cannot build. More smoke and mirrors here. It's the Photo Op Effect. The Vatican always wants the Photo Op more than the other side. There is always an unequal bargaining position, and the Catholic Church always gives up more than it gets. On the other hand, the agreement finally forced Francis to condemn homosexual marriage and define marriage as between a man and a woman. Is the Uniate path the one to back into the future? Maybe not. But you're right that the Russian Orthodox despise the idea of Catholics in Russia. Interesting agreement on a lot of grounds. Did you notice mention of martyrs (or persecution, don't remember) of "various Churches?" Wonder what that means. Orthodox is considered a Church, and of course, Catholic Church... are they thinking of anyone else? I am more disappointed with Kirill and Bartholomew than with Francis. You know what you are going to get with the post VII Popes but it is disappointing to see the East going in this direction of false ecumenism. Paragraph 7 describes the differences between the two entities as “historical” and in paragraph 5 it describes these differences as mistakes in “the understanding and expression of our faith in God” instead of real concrete non-historical differences. Or in other words, it appears to say that we have the same faith, it’s just after the first millennium it is now described differently and hence misunderstood. The issue is due to "historical" circumstances, not doctrinal ones. Further, paragraph 7 calls on Catholics and Orthodox to witness the Gospel together. Without specifics, this implies that they can both equally give witness to the same Gospel, regardless if there are doctrinal differences; i.e. 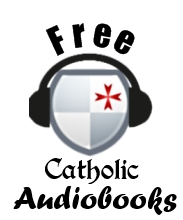 it doesn’t matter if a truth of the Catholic faith is communicated, heresy and error can be tolerated in order to communicate the general truth of the Gospel. Further, paragraph 12 calls Christians who have died for their faith, regardless of denomination, “martyrs.” Only dying for the Catholic faith can one become a martyr, because you are giving witness to the Catholic faith, not the faith of another Christian tradition. Those who die for Christ and who are not Catholic may indeed be true martyrs, but no one can judge the imperceptible, as they did not visibly die for the Catholic faith. Without an explicit definition of the word “martyr” this paragraph has the danger, as well as paragraph 7, of being interpreted in an indifferentist manner, e.g. salvation is obtained outside the Church, or that the true Church is invisible and every Christian is, without qualification, a part of the Catholic Church. Yeah I did notice all that. The "historical" thing is very common in newspeak when dealing with the Orthodox. Of course I did not want my piece to be crazy long so I chose just to focus on the Uniate issue. Boniface, you mention that the "Orthodox" are schismatics. But aren't they heretics as well since there are dogmatic points that have been accepted into the faith that they refuse to accept? Or is there a reason to not call them heretics? I am just asking because I am a bit unsure about the terms themselves. The only reason I omitted using the word "heretics" is because the Russian Orthodox are independent of the Greek Orthodox and I do not know the degree to which the Russian Orthodox accept or reject the various positions espoused by the Greek Orthodox. So I am in ignorance on the point. Thanks Boniface! Sorry for going off topic, but I was afraid I might be using the term wrong. All in all, I think the worst aspect of this is that signing such a document downplays the merits those Catholics from the East who suffered or even died for their faiths. To be frank, this post is vapid and insulting -- not just to the Orthodox, but to Eastern Catholics as well. You reduce Eastern Catholics down to some sort of "exotic attraction" who are merely tolerated in return for their allegiance to the Pope, which implicitly denies their status as true particular churches. Moreover, you seem to be ignorant of the fact that some Eastern churches, such as the Maronites, have always been in communion with Rome and thus their existence has nothing to do with any special concessions won. "There is not really any question of doctrine involved. It is not a heresy, but a schism. The Decree of Florence made every possible concession to their feelings. There is no real reason why they should not sign that Decree now. 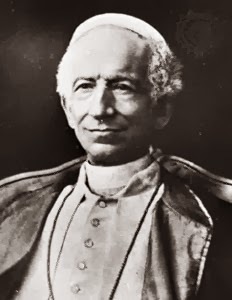 They deny papal infallibility and the Immaculate Conception, they quarrel over purgatory, consecration by the words of institution, the procession of the Holy Ghost, in each case misrepresenting the dogma to which they object. It is not difficult to show that on all these points their own Fathers are with those of the Latin Church, which asks them only to return to the old teaching of their own Church. That is the right attitude towards the Orthodox always. They have a horror of being latinized, of betraying the old Faith. One must always insist that there is no idea of latinizing them, that the old Faith is not incompatible with, but rather demands union with the chief see which their Fathers obeyed. In canon law they have nothing to change except such abuses as the sale of bishoprics and the Erastianism that their own better theologians deplore. Celibacy, azyme bread, and so on are Latin customs that no one thinks of forcing on them. 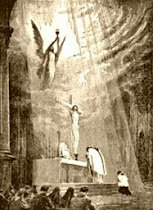 They need not add the Filioque to the Creed; they will always keep their venerable rite untouched. Not a bishop need be moved, hardly a feast (except that of St. Photius on 6 Feb.) altered. All that is asked of them is to come back to where their Fathers stood, to treat Rome as Athanasius, Basil, Chrysostom treated her. It is not Latins, it is they who have left the Faith of their Fathers. There is no humiliation in retracing one's steps when one has wandered down a mistaken road because of long-forgotten personal quarrels. They too must see how disastrous to the common cause is the scandal of the division. They too must wish to put an end to so crying an evil. And if they really wish it the way need not be difficult. For, indeed, after nine centuries of schism we may realize on both sides that it is not only the greatest it is also the most superfluous evil in Christendom." I have read the article and the comments with interest, but my comment is not on the content. Rather I want to relate that your Subscribe button is not working in Chrome. I had to switch to Explorer to subscribe, and I only know to try this by the grace of God; others may not. Is it fixable? I don't think it is a absolutely certain that the Maronites have always been in communion. They have been in formal union with Rome since 1181. Before that, there were some episodes with monothelism and parts of their early history seem to be sketchy. What matters is that they are in full communion now. 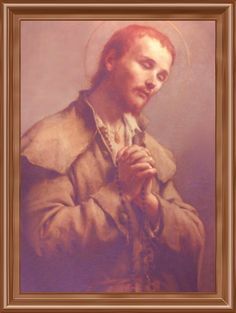 Had ordered Life of St. Colomba on Feb. 5. Can you tell me when I will receive? It shipped on Feb. 11th, which was a Thursday. Usually takes a week in transit, so I would expect it any day now. I only asked the question about heresy and schism exactly because I don't want to call someone something they don't deserve. Aside from that, while I can understand how these terms can be hurtful, I think it is important they are kept, for otherwise you risk causing confusion on the people inside your own Church. I've had trouble with that before, and I believe that avoiding having catholics fall into schism should come before any kind of politicking. Also, please don't misunderstand me. 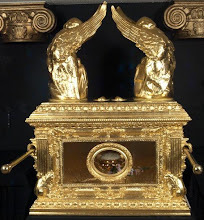 I would be very happy to see these churches being brought back into communion. I have a great deal of respect for those Catholics who are a small minority in their own countries. I don't mean to try to impose anything of my specific church on them. But as far as I understand, obstinately denying the Immaculate Conception is a heresy. Otherwise, I agree with you in that we must not put up barriers to the reconciliation where none need to be. I also don't think it was boniface's intention to sound disrespectful. I got the impression he simply wanted to go over the issues quickly so he could get to his point. I'm from a Protestant and Orthodox family background, i. e. the descendant of heretics and schismatics. History has shown that neither tough talk nor friendly invitations have had any effect on the great majority of Orthodox leaders, so you might as well call them what they objectively are, schismatics. I believe that those who are already leaning towards Catholicism and reunion should be treated friendly and, as much as possible, fraternally without being indifferent. 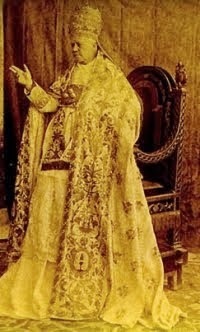 Famous converts, such as Mar Ivanios, the first head of the Syro-Malankara Catholic Church, have alluded to the feeling that something was wrong with them or the "church" they were in, so usually they won't need words such as "heretic" and "schismatic" since they know that their situation is problematic. I totally agree with Alex that these distinctions are absolutely necessary as a safeguard, especially with the rampant orthodoxophilia that can even be found among so-called Trads. They will rush to the defense of the supposed Coptic "martyrs", even though it is a simple fact that "orthodox" Copts are separated from the Church. Nonetheless, Catholics have the nerve to invoke them on their blogs. I don't say the are in Hell, but invoking them as martyrs is scandalous. To wrap up this comment, similar behavior can be seen in regard to Sedevacantists. There are some Pan-Traditionalists, probably very well intentioned, who go around and praise the liturgical studies of a well-known Sedevacantist priest. Others attend the Pontifical Pentecost Vigil (pre-Pius XII) at Sedevacantist chapels without giving it much thought. The liturgy is certainly interesting, but why would a Catholic attend a Mass where the name of the current pope is omitted in the Canon? Indifferentism or false ecumenism has many faces. It isn't just your local parish priest who lights a Menorah with his rabbi friend. Fr. Fortescue is wrong, it IS about doctrine. If one denies the immediate, universal jurisdiction of the Pope then we have a doctrinal problem. Ditto with the Immaculate Conception. Any talk of historical circumstance when it comes to doctrine is coming awfully close to Modernist historicism, albeit perhaps unintentionally. "But the Catholic encyclopedia..." But what? It can be, and has proven to be wrong sometimes. What? Is it an authority? "But it’s still not about doctrine, you wouldn't know..."
Oh? I have been taught by an Orthodox priest formally, among other Orthodox sources. The filioque is a denial of doctrine, the misconstruing of hell is a denial of doctrine (e.g. people can get out of the hell of the damned if they repent and people pray for them). Then there are issues with divorce and contraception in some instances. It’s doctrinal, on faith and morals. I have never read this elsewhere, but the Baltimore Catechism states that at least since the First Vatican Council and the dogmatization of Papal Infallability, all schismatics are also heretics. And it makes sense, because if you don't hold this as of the Faith, you are a heretic. 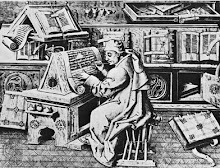 It's not the Church's problem that you have not participated in previous Ecumenical Councils or haven't given assent to ex cathedra teaching simply because you were and still are in schism.Sometimes it seems that people think "well, they didn't participate in this or that council so they don't believe this as de fide. But that's not a doctrinal problem". Very true. However - and I submit this as a thought experiment - it seems that there are situations where a person could be a schismatic and not a heretic. For example, suppose you have a person who for whatever reason has refused submission to the Roman Pontiff. And, upon pointing out that submission to the Roman Pontiff is an article of faith that they must assent to, they say, "Oh I assent to it. I know it is true. I'm just being a bad Catholic", or "I know you're right; I just don't care." 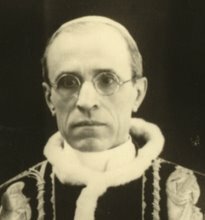 In other words, saying every schismatic is a heretic presumes that the schismatic is trying to justify his schism by giving some explanation of why he should refuse submission to the Roman pontiff; but does that still work when a schismatic makes no attempt to justify himself, as in when he says, "Yeah, I believe I should be submitted to the Roman pontiff. I'm just not because I don't care"? You're right, in that case he would be merely a schismatic. That might be the case with many sedes, although they don't believe they're "bad Catholics", but that the problem is on their opponents' side. But that's a complex issue. I for my part have not come to a conclusion yet whether sedes are heretics or simply objectively in schism. 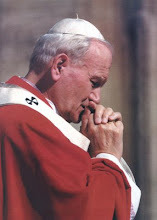 I don't know if not believing in the infallibility of Pope John Paul II's decision regarding women ordination makes you a heretic if you believe he wasn't a legitimate pope. All very confusing. In Jim Larson's book "War Against the Papacy" (which I sell on Cruachhill Press), he makes the case that Sedevecantism is a heresy because he argues that Vatican I not only teaches that the Petrine office will continue until the end of time but that it will always be filled with a particular man in unending succession - which runs counter to the Sede premise of an "office" that somehow continues despite not being filled. Thanks, Boniface. That makes sense.